Everyone attending the 2005 PASS Awards Banquet on November 5th felt like one of the family from the very start. Ben Rowe and his father Mike were on hand to receive their trophies for first and second place in the 2005 IBG-PASS Championship standings, but there were also a few surprises during the evening. Allard ended by thanking his new wife Alice for her help as his tire specialist, and a collective “awwww” echoed throughout the banquet hall. Before the IBG PASS series trophies were handed out, I had the honor of presenting the first ever Speed51.com Most Popular Driver Award to Travis Benjamin. Benjamin is optimistic about next season despite suffering some bad luck this year. Ben and Mike Rowe did make it to victory lane this year and ended the season first and second in points. Mike wasn’t the one who got to give the speech or pose with his team for photos while Queen’s “We are the Champions” played over the speakers, but he was excited for his son and his achievements. Both father and son were quick to point out the other’s talent. “He does a great job of driving. I tell you, he’s got a lot of talent, and I’m old and feeble now, but it’s a lot of fun racing with him,” said Mike. Even in his speech Ben Rowe downplayed the success of his season and gave credit to his team and his father. The Rowes race together and work together. During the week Ben works for the construction company that his father owns. So does their on-track competition ever get in the way of their work or their relationship? “If he wins its an easy week,” said Ben with a grin. Even when there are bad weeks the two still get along. The newly crowned PASS champion, Ben Rowe. 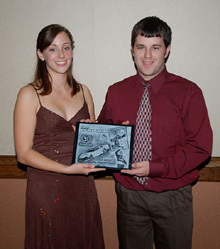 Speed51.com's April Barker (L) presents Travis Benjamin (R) with his Most Popular Driver hardware. Only about five minutes after arriving at the Verrillo’s Convention Center in Portland, Maine I was informed that not only would I be attending an Awards Banquet--I would also be a guest at a wedding. PASS Modified Champion Wayne Allard surprised his longtime companion Alice Colbath by holding the first ever PASS sanctioned wedding ceremony at the start of the banquet. 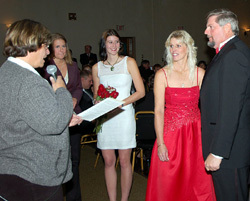 A justice of the peace led the unconventional ceremony in front of friends, family, and over 300 guests. There’s no word yet on how much she wanted to kill him for it. Both father and son admitted to racing each other hard, but clean. “We don’t give each other anything, but we race each other clean, and we know we’re not going to clean each other out so that’s the biggest thing,” said Ben. It would make for a better story if third and fourth place Cassius and Johnny Clark were also related, but the two are just good friends. 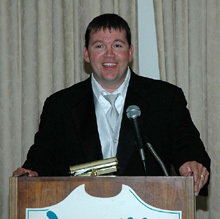 Johnny Clark came in a close second to Travis Benjamin for the Speed51 Most Popular Driver Award, although Travis said he thought for sure Ben Rowe would be named most popular. I’m sure Ben Rowe is plenty satisfied with his championship trophy. Congratulations again to Ben and Mike Rowe, the popular Travis Benjamin and, of course, newlyweds Wayne and Alice Allard.